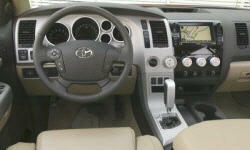 Need advice about a specific Toyota Tundra problem? Chart based on 60 repairs. 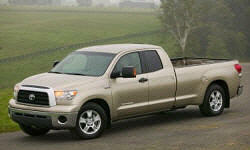 See TSBs and recalls for the 2010 Toyota Tundra. Chart based on 45 repair trips. The repair cost chart excludes repairs made under warranty, do-it-yourself repairs, and repair trips that include maintenance. See repairs for all Toyota Tundra model years. US $950 Replace dead Alternator. 100000 mi Four wheel alignment. 39500 mi 4x4 wouldn't in engaged or disengaged,engine light was on ABS light. 26900 mi The center cap of one of the wheels inadvertently came off. This was not related to an accident or off-roading. It may have even not been replaced during a recent oil maintenance. The dealership replaced for free. 59000 mi One of the center caps on the wheel broke and needs replacement. I've found that these aren't easy, or consistently, re-installed by the non-dealer shops I take the truck to for tire service, alignments, etc. Sometimes they look like they're mostly in place, but not quite 100 percent seated. Other times, trying to seat the cap will break one/some of the attachment tabs...2nd occurrence over the almost 8 yrs of ownership isn't horrible, but annoying. Tail-gate lever and key is problematic. It is difficult to pull the lever to open the tailgate and the lock has been difficult to get the key into. I took the inside panel off the tailgate and lubricated everything with a silicone lubricant which helped in the short term, but it's been getting more difficult again after a couple months of regular use. One of the TRD off-road stickers has been showing signs of aging over the past year. Showing to the point of the sticker is showing visible partitions within the border of the sticker like it's starting to come apart. 45000 mi Broken Leaf spring on left side third leaf down just above over load, break point behind centerline on axle by 6 inches, same break points as found on Tacoma’s. 57040 mi Radiator leaking slightly, Replaced under warranty. No cost. C $200 Replaced leaking rear shock absorber. 24800 mi Oil leak (seepage) from valve covers. Squeak in dash, passenger side. Very loud noise from windshield trim when driving at highway speed in strong crosswind. 9400 mi Wind noise from the rear window (between cab and box). They changed the rear window but the noise did not disappear. 16120 mi Lived with the wind noise until I sold the truck. 36000 mi Felt like truck ran over a rumble strip on smooth road surface. 47000 mi Transmission not shifting properly. Hesitant to downshift. 79000 mi Smog pumps were replaced free of charge. The factory warranty on this system was extended to 10 years/150,000 miles. Solenoid valves were replaced as well. Truck was sold shortly after repair was made. 34720 mi drive shaft replaced under warranty. Joints were shot and Toyota was aware of the issue with a service buuletin. US $325 Radiator leaking from engine side. Radiator was replaced. 14000 mi Rear wheel bearings. 21000 mi Variable valve timing spring - wrong part installed at factory requiring an engine teardown. This has tripped check engine light several times. I traded this truck off, it is not reliable enough. Bearing or differential noise still present when traded. 32000 mi Parking brake mechanism was locking up and left rear parking brake was getting hot and shaking at 40-50mph. Dealer claimed they lubricated but only lasted a few months. Got under and cleaned/lubricated thoroughly myself and its been fine. US $400 Bed Bolt finish failed and all bolts were very rusty. My truck is super clean and dry. Not used for hauling. Poor quality bolt finish. Toyota would not cover. Brake pedal extremely soft. Pads were good per dealer but they replaced cleaned, and adjusted brake system. Brakes perfect now. 40500 mi When truck sat in sun Sirius didn't work. Replaced antenna, then radio. In both radios the volume for Sirius is very low compared with plain am fm or DVD. Be careful with volume when switching from Sirius to the other. 74200 mi front driver seat leaning to the right - they said the frame is bent and it will cost $1,000.00 to fix. So I'm leaning to the right like in the 80's. lol rusty bed bolts - was told it would cost 260.00 to replace the six rusty bed bolts that i thought was under warranty. NOPE! US $372 replaced battery and starter. had to pull off passenger exhaust and manifold to get to starter. 15000 mi Air Conditioner Blower on high is half the volume at dash vents of 5 other vehicles I checked. 39000 mi AC fan completely quit, was not working when took to dealer and service writer observed. When dealer finally took in for service, fan was working again. Kept 2 days and could not duplicate problem, so apparently there is no problem. 39700 mi Fan quit working again and took to dealer, did not let them turn off engine until running diagnostics, determined blower fan failing. Only took 4 trips and 2 years of intermittent fan completely stopping before finally repaired. US $70 Blower motor started intermittently going out for 2nd time. Took to dealer when not working, could not get tech to check. Dealer kept for 4 days trying to replicate, finally ordered motor. Fan still does not blow hard like other cars. 9060 mi Seals around tonneau cover. some of them tore early in their life. Dealer had a problem getting the right seals. Still need some more to be replaced. 56420 mi Check engine light came on, gas cap was not tightened on fueling. Tightened gas cap and several days later, check engine light went off. 200 mi ABS actuator was defective and replaced by dealer. 1240 mi ECM update for tranmission shifting. ECM update for tranmission shifting. 9300 mi Passenger power door lock mechanism failure. See our lemon odds and nada odds page to see vehicles with no repairs or vehicles with more than three repairs. To see how frequently 2010 Toyota Tundra problems occur, check out our car reliability stats.